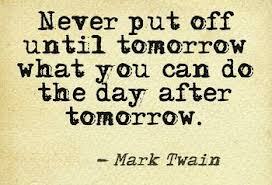 Do you find yourself postponing things you have to do? Like sending important emails, or making phone calls that have been on your to-do list for days?! Or even going to the gym, paying the bills or launching your business? Are you finding excuses to avoid doing that? Such as being too tired right now, or not having enough time, etc.? there’s no failure, only feedbacks. We learn from our mistakes. If you look back at your life, I wonder if you already recognize that your biggest learnings come from what you thought at the time were failures…I certainly do! What you consider as failures simply relate to your behaviour, not your identity. Making a mistake doesn’t mean you’re worthless. It simply means you need to change what you did, to do it better next time. Sometimes fear of success can also be behind procrastination… A lot of my clients, when they recognize having this feeling believe it doesn’t make sense. I think it actually sometimes relates to the fear of change: if you succeed at what you’re doing, things might become different and that can be scary. There’s a really good book I recommend on that, which is also pretty easy to read: “Who moved my cheese“ by Spencer Johnson. And sometimes it is simply to recognise that perhaps what you have to do, maybe your job, isn’t motivating because deep down you don’t like it. A client of mine last week was talking about procrastinating only when he was asked to perform a task by his boss at work. And quickly admitted that he hated his job and deep down wanted to do something completely different. All those fears and patterns are very common; I found that most people suffer from them. And the good news is that it is possible to shift them around and replace them with some empowering feelings instead, using for example some powerful NLP or hypnotherapy processes such as a blend of core-transformation, metaphors and submodalities work. The first step I encourage you to do for now is to find out if it’s a fear that stops you taking action. Are you scared of what people will think of you? Are you scared of being found out? Or not being good enough?